The concept of an up-and-coming team is usually hinged on said team having a foundational superstar, two or three stars that complement said superstar, a cast of role players, and a coach that can put all these pieces together. The Minnesota Timberwolves fit that description. It has Karl-Anthony Towns, who was the runaway choice among NBA general managers as the man they’d want to build their franchises around. More than Stephen Curry. More than LeBron James. And a hell of a lot more than Anthony Davis, the consensus choice (one year ago). It has Andrew Wiggins. It has Zach Lavine, Ricky Rubio, and Gorgui Deng. It also has Tom Thibodeau, who many regard as one of the top five coaches in the NBA Now. On paper, the Timberwolves are the kind of on-the-cusp team that fair-weather fans latch on to when they think that they’re on the verge of breaking through that proverbial glass ceiling on their way to becoming contenders. That promise of future prosperity can be intoxicating for fans, which is why entering this season, the Minnesota Timberwolves’ bandwagon was filled to the brim, maybe even overflowing. A lot of people probably noticed it too, now that the NBA has itself become a self-sustaining, 24/7 news cycle. 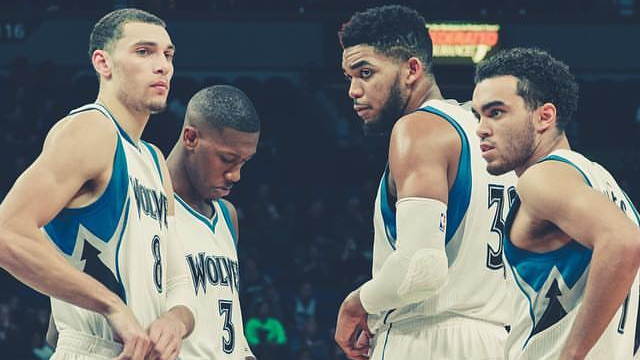 The Wolves were the belles of the 2016-2017 NBA ball—or ballers of the ball?—the team that was already being anointed as the breakout team of the 2016-2017 season. Except that a month into the NBA season, the Minnesota Timberwolves are languishing with a 5-13 record, third worst in the league behind the hapless Dallas Mavericks and the Philadelphia 76ers, the long-time renter of the NBA’s basement. To be fair, nobody expected the Mavericks to be the worst team in the league either. But the buzz around the Mavs was muted compared to the showers of praise and adulation prematurely being thrown Minnesota’s way. The Timberwolves not only have a budding superstar, they also have a complementary star, studs on rise, and a new coach in Thibodeau. The combination of young talent and potential in this Wolves team is admittedly scary, but as the first month of the season has shown us, talent and potential alone don’t equate to success. You actually have to work to attain success, something the Wolves have not done enough, not because they don’t want to, but because they haven’t been given enough time to. That’s the biggest issue hounding the Timberwolves. People immediately assumed that greatness awaited a team that had Towns, Wiggins, LaVine, Deng, Rubio, and Thibodeau. Those assumptions came while completely ignoring the fact that not only is Towns just 21 freaking years old and is only in his second season, but so are Wiggins and LaVine. The Wolves’ three best players have yet to turn 22 and they’re already expected to make the leap, just because they have Thibodeau as their coach? It doesn’t matter how good you are or how much talent you have; when a new coach is just coming in to implement a completely new system that requires painstaking hours learning about x’s and o’s on both sides of the ball, even the simple task of absorbing those concepts is going to take some time, especially when these concepts are coming from a known taskmaster like the ex-Chicago Bulls coach. What we’re seeing now from Minnesota is the manifestation of learning this new system on-the-fly, and the results, if you’ve watched most of their games, paints a startling Jekyll and Hyde portrait of the team’s season so far. That’s a mark that’s better than every other team in the league, including the Golden State Warriors. But the Wolves completely fall off the cliff in the second half. The third quarter, in particular, is when the team suddenly turns into an abomination, posting a net rating of -28.1 points per 100 possessions so far this season. That’s the single most inept quarter any team has had in the past 20 years. The Grand Canyon-sized discrepancy in half-to-half performance is the perfect representation of a team that’s still searching for its own identity, and that’s exactly where Minnesota is at this point in the season. They’re not wolves yet; they’re still pups with a lot of learning to do before they can tap into the expectations a lot of people placed on them. The good news for the team and its fans, legitimate or otherwise, is that the NBA has just reached the end of its own first quarter schedule. There are still three quarters of basketball left to play and no matter how tempting it is to bail out and jump off of the Minnesota bandwagon, the Wolves’ 5-13 record doesn’t paint the picture of what’s to come in the next five months. Ultimately, it’s a matter of how fast Towns, Wiggins, and company can learn their new surroundings and figure out the best ways to thrive in it. That’s something that only time can tell, and how long it takes them to get there will determine how long that march to greatness prematurely expected of them is going to take.